New Commissions are unique designs created by Alan Robinson for you. Each Stained Glass Panel is designed to fit a particular space, following detailed consultation. "I cannot tell you how much I absolutely love the window! It is just perfect. It is exactly what I had in mind, and is such an amazing piece of art! The colours are amazing and send lovely shades onto the walls when the sun shines." Edinburgh Door in Victorian style - replacing modern obscure glass. This door panel was commissioned in 2018. It features the family crest and oak leaves, painted and stained. A contemporary design in a traditional setting. This window includes an etched dedication. Typically a first meeting (at the studio or at your home/premises) will discuss your general ideas and budget. From this, I will create some sketch designs and an estimate. Further meetings will look at glass samples, fitting issues and refining the design. Once a final design and cost has been agreed, a timescale for production is arranged. Sometimes a 25% deposit is required for material outlays, otherwise the fee is payable on completion. 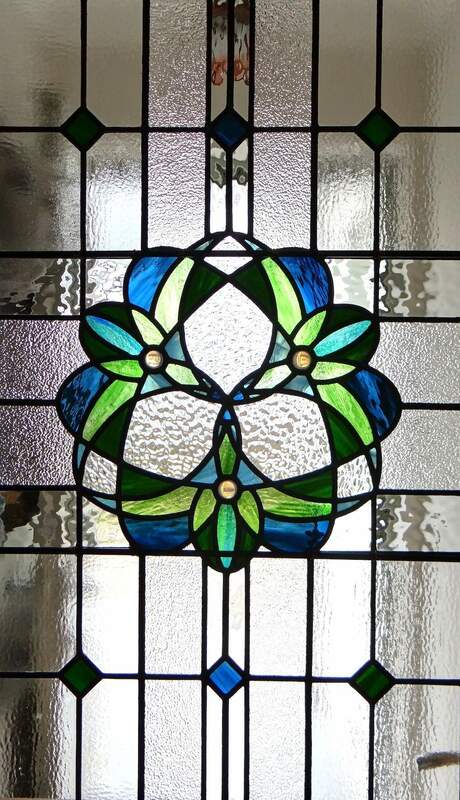 "Alan designed and made a stained glass panel for a door in a listed cottage we own in Luss. This was the first time we used Alan and would use his services again as we were very happy with the whole process and delighted with the end results. His communication both by email and telephone were excellent, we went to his workshop twice to chose samples and see work in progress and he made two home visits. He was punctual and efficient, made the panel in the time frame discussed and installed it as planned. He gave us an initial quotation, then as our design and materials changed he let us know that it affected the final cost. We would recommend Ramoyle Glass Studio to others and use him again." "Alan designed and created a beautiful stained glass window for my hall in Autumn of last year. My brief was a bit vague and changed radically after his first visit re colour and design, and on his next visit he produced 4 possible designs. Having chosen the design, I visited Alan in his workshop to choose the glass. He was easy to work with, steered me through possibilities and was open to my ideas too. A couple of weeks later the glass was ready and a perfect fit. Again Alan came and installed with ease. Am very happy with it and it is much admired by all. " 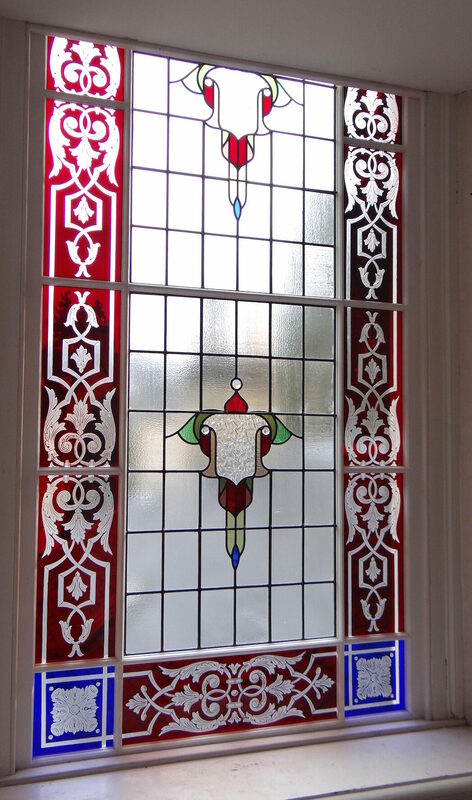 This Stained Glass window was designed, made and fitted by Alan Robinson Glass for a private commission. It is fitted in a lovely restored house in Perthshire. The Africa theme is a reminder of safari holidays by the owners. The window is 820mm x 1870mm made in three sections. The glass was etched, painted and stained to create the elaborate images. The paint is built up in layers and some pieces of glass will have been kiln fired up to seven times. Alan Robinson is exhibiting glass based artwork at Merz Gallery, Sanquhar from 19th April - 31st May 2019. The joint exhibition with glass artist Marta Sienkiewicz-Sutherland is entitled "Past Participle - Seen Through Glass". Alan Robinson Glass, produces unique contemporary and traditional Stained Glass to the highest craftmanship. Alan is a visual artist and designer with a Degree in Fine Art. 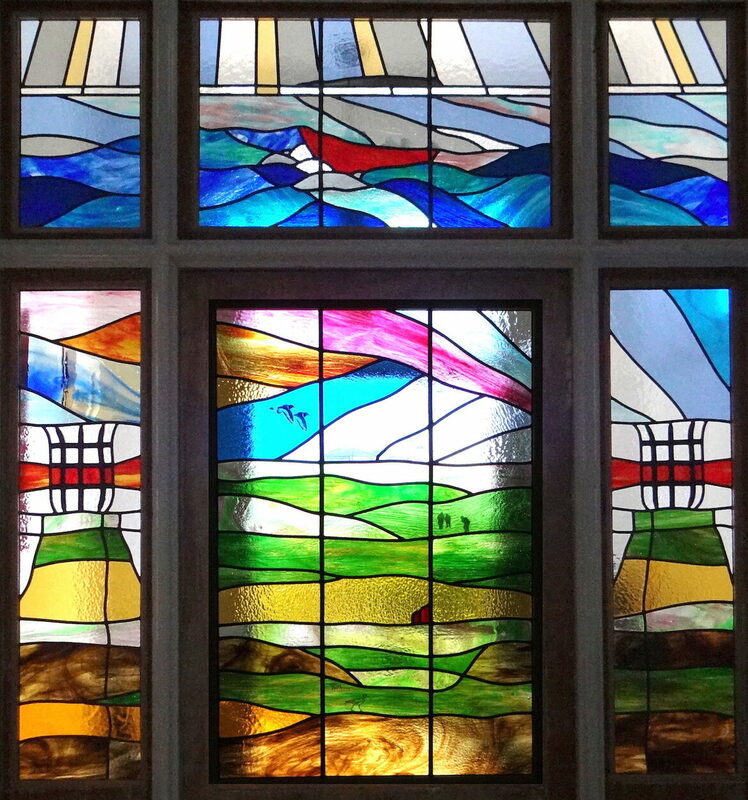 Alan Robinson Glass specialises in designing and making dramatic, original stained glass. We work closely with clients throughout Scotland to achieve their vision and reflect their design choices. We have considerable experience and expertise in repairing, restoring or reproducing, historic stained glass windows. 2.35m x 1.02m - Etched, painted and silver stained glass. Completed in April 2018 for St. Ninian's High School, Glasgow. Original design by Alan Robinson. 2.35m x 1.02m - Etched, painted and silver stained glass. 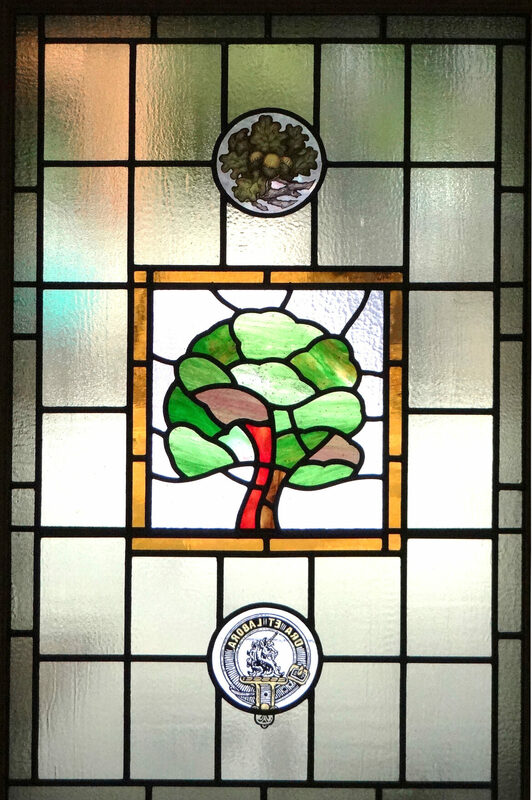 This window completed in January 2018 is installed in St. Ninian's High School, Glasgow. This is my original artwork - the design is based on a similar motif by Edward Burne-Jones. Ramoyle Glass Studio was established in Dunblane in 2005, moving to Glasgow in 2009. A new studio was opened in St. Margaret's House, Edinburgh in 2016. Ramoyle Glass Studio is now known as Alan Robinson Glass. 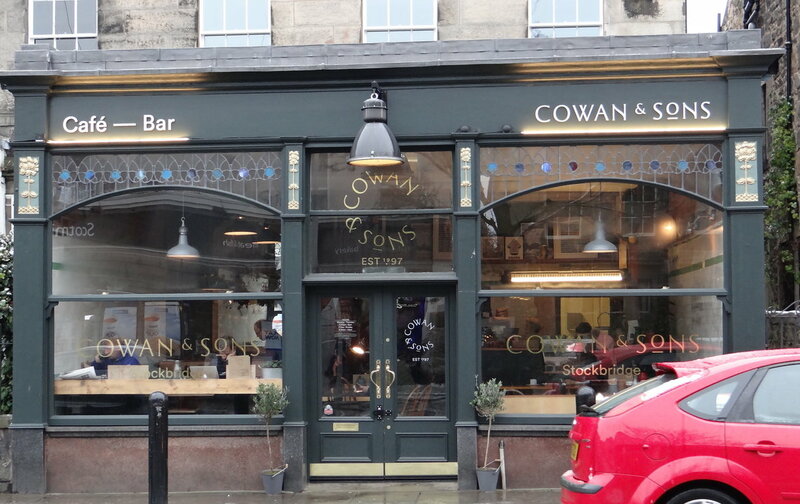 Over the past 11 years, clients have included Historic Scotland (Culross Palace), Queen Victoria School Dunblane, Camphill Blairdrummond, and numerous churches, businesses and private residences. 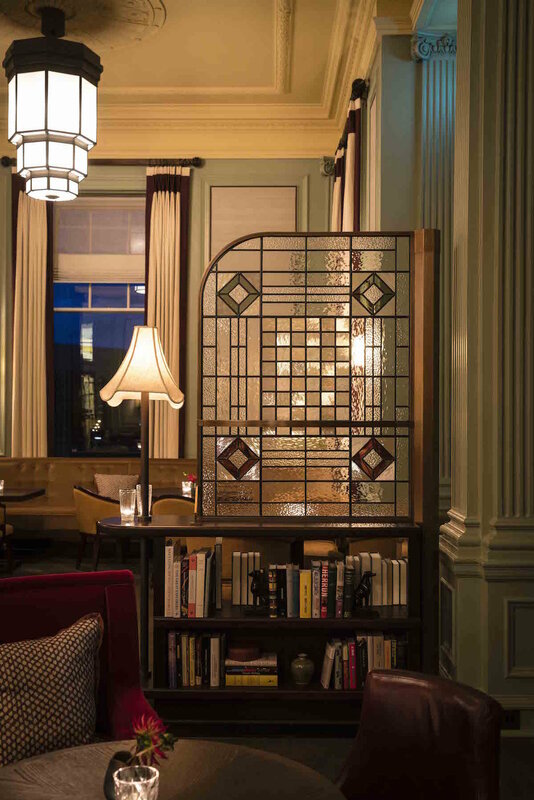 Most recently, Alan Robinson completed a commission to design and make six large stained glass panels for Gleaneagles Hotel, where the bar was undergoing refurbishment designed by David Collins Studio, a leading international design studio. We take pride in our close working relationship with our customers and provide a start to finish service, alongside a problem-solving approach to whatever challenges each commission brings. 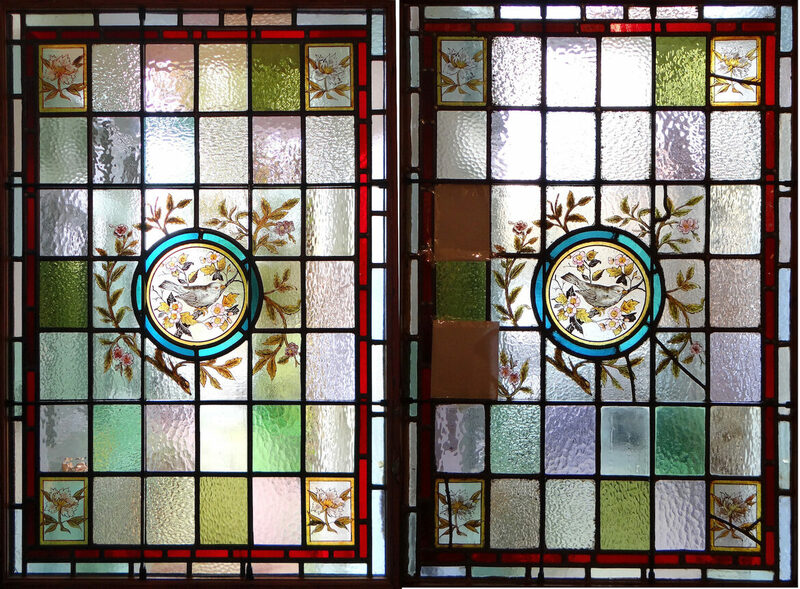 These images show a completed reproduction window in Bridge of Allan. The 4.0m high stair window was destroyed by gales, leaving just a few border sections intact. A new window frame was made and some of the original border glass re-used. 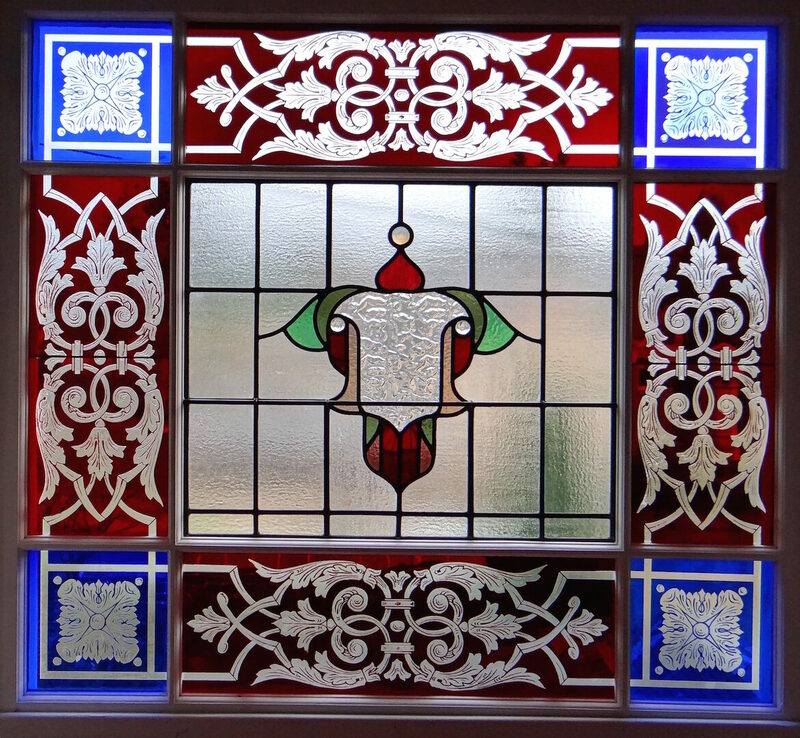 The reproduction red and blue flashed border glass has been acid etched to create the intricate design. 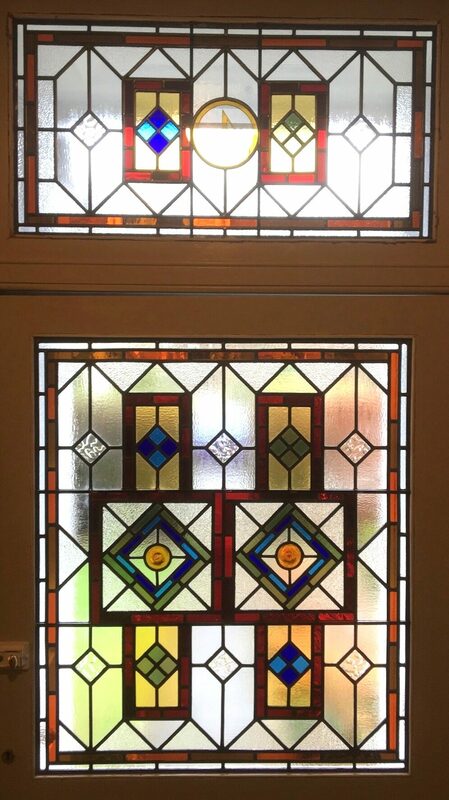 A new design was created for the central leaded glass panels, using an existing window in the property as a guide. Traditional Stained Glass Windows (Leaded Lights) can last for hundreds of years, but they are adversely affected by vibration, physical damage, shrinkage and expansion due to temperature changes, pollution, or water damage. This leads to broken leads, failing cement, loose and broken glass and a build up of deposits. The 'saddle bars' (metal rods tied to the panel with wire) can become detached, losing their effectiveness as supports. The glass itself can be broken or missing. Door panel repair - six of the painted panels were reproduced and a couple of previous repair mistakes were redressed. Often, previous repairs have been badly carried out, using non-matching glass, or plain glass where the original piece was painted. It is easy to see repair lines which have been added over the years to old windows. Some windows will have been removed and rebuilt several times. If a window is to last and remain in sound condition, then periodic maintenance is required. Alan Robinson Glass offers a full Repair and Restoration service, including removal and refitting. I will assess the damage and provide guidance and cost estimates for remedial work, prior to undertaking any agreed work. Windows are often removed for repair, although minor repairs can be done in-situ. Badly deteriorated leading may require a window to be dismantled and rebuilt, using the original glass. Painted panels can be reproduced or repaired, as appropriate. We are able to source a wide range of traditional glass types in order to match original glass which is broken or missing. Restoration involves removing the leaded panels and fitting temporary glazing or boarding. A tracing is made of the panel and each piece of glass is numbered. The panel is then fully or partially dismantled. The broken or missing glass pieces are matched with new glass, or repaired with lead or specialist glue. Decorative painted elements may be faithfully reproduced using traditional fused paints, enamels and silver stains. The panel is then rebuilt, using matching traditional lead 'cames'. The final stage is cementing and polishing the panel. Where Conservation Standard work is required, the aim is to retain as much original lead and glass as possible and to document the restoration work. Repairs can also be carried out to Tiffany style (copper foil) glass items. Sand and acid etched glass can be reproduced from a damaged (or matching original) panel. Missing leaded or painted panels can be accurately reproduced from similar panels, such as in a neighbouring building. Traditional fired-on paints, silver stains and enamels are used. Other techniques may include acid etching and sand etching. Great care is taken to create the impression of an original window, including distressing the paint to match other older parts.